Looks like Dana Perino wasn’t the only one to impugn Sarah Palin’s intellect on yesterday’s Fox News Sunday. 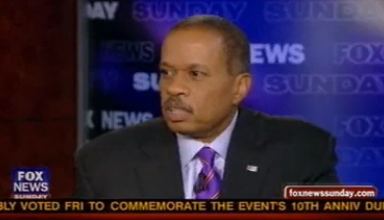 While the panel was predicting (or failing to predict) the 2012 Republican candidate, Juan Williams pointed out that none of the prospects named so far could compete with Barack Obama charisma-wise except for Sarah Palin then adding, offhand, that she wouldn’t be able to compete with him intellect-wise. Ouch. Someone is totally gonna get chainsaw massacred. Everyone reacted audibly with Chris Wallace giving a smiling “Oooookay” as if to say “Man, this clip is absolutely going to be on every website in the world tomorrow.” Yes, Chris. Yes it is.